Watch full One Piece Season 15 Episode 50 English Dubbed full HD online. One Piece Episode 566 English Dubbed online for free in HD. Hordy uses to the Energy Steroids to recover and overpowers Luffy, biting him again in the same spot. Luffy retorts with another Red Hawk, but Hordy is still standing. Chopper reveals he now only needs one Rumble Ball for his Monster Point, which he now has full control of. Usopp, Franky, Sanji and Jimbei prepare to end things with their opponents. Luffy attacks Hordy with Elephant Gun and finally defeats the fishman. Hordy wishes for the Noah to destroy the island and the Fishman who have lost their pride. Brook uses his sword to defeat Zeo, Usopp uses his Green Star techniques to defeat Daruma and Chopper uses his claws to defeat Dosun. Franky blasts Ikaros with his Franky Radical Beam technique. Jimbei sends Wadatsumi flying and Sanji finishes him off with his Hell Memories technique. 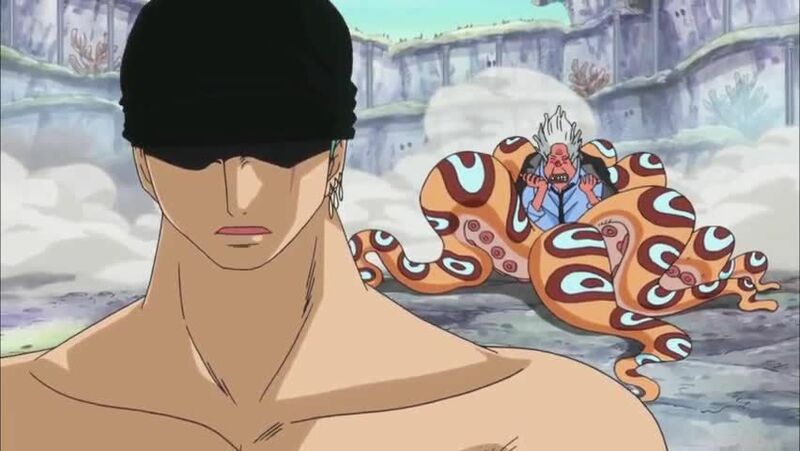 Hyouzou attempts to attack Zoro from behind only for Zoro to counter and destroy his swords again and defeat him thinking he was a frog. Luffy uses his Elephant Gatling technique on the ship and Hordy is finally blasted out unconscious. Luffy prepares to destroy the ship to save everyone on the island.